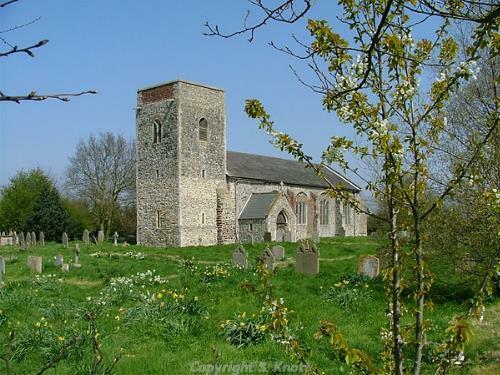 The parish of Skeyton is situated in the north of Norfolk. It lies southwest of North Walsham, east of Tuttlington and Brampton and west of Swanton Abbott. The name Skeyton derives from the Old English meaning ‘Skeggi’s Farm’. Unusually, the parish is not mentioned in the Domesday Book of 1086, and the reason for this is not known. Perhaps Skeyton had not been established at this time or was too small to merit a mention. Alternatively it may have been included (but not named) as a part of one of the surrounding parishes. The earliest find recorded in the parish is a flint flake (NHER 7537) dating to the Palaeolithic period found on lands near to Whitwell Hall. Another very early find retrieved from Skeyton took the form of a miniature adze (NHER 36566), the purpose of which was unknown. However, the majority of the prehistoric finds from Skeyton date to the Neolithic, and comprise worked flint tools. Three Neolithic flint axeheads have been found, with one of these from land at Primrose Farm (NHER 7577) and another near ‘The Corner’ (NHER 7578). A couple of Bronze Age artefacts have been found in Skeyton. The most significant artefact to have been retrieved was a Late Bronze Age gold penannular ring fragment (NHER 38090). A flanged axehead (NHER 33648), socketed axehead (NHER 24159), ingot (NHER 24159) and pottery sherds (NHER 22873) comprise the other finds from this period. In Skeyton most of the objects from the subsequent Iron Age are coins (NHER 22873) although a single terret (NHER 38090) has also been found. One of these was a particularly fine gold stater (NHER 35145). A large number of Roman objects have been recovered across Skeyton through a combination of metal detecting and fieldwalking. The most interesting find was an unusual Roman figurine of the Ancient Egyptian goddess Isis suckling the infant Horus (NHER 36588). Sadly this figurine was fairly badly corroded and had several pieces missing. Other finds of note consisted of a phallic pendant (NHER 35323), nail cleaner (NHER 21788) and steelyard weight (NHER 22769). Of course a good number of more mundane Roman finds have been recorded for Skeyton such as part of a key (NHER 22226), metal vessel fragments (NHER 23248) and numerous pottery sherds (e.g. NHER 22451) and coins (NHER 22763 and 22764). A scatter of metalwork objects, many of which are typical objects from this era, represent the Saxon period in Skeyton. Several brooches have been recovered including cruciform (NHER 21786), annular (NHER 22226) and disc-shaped (NHER 23248) examples. A delicate silver belt loop (NHER 25682) was also found southwest of Fir Tree Cottage. In addition to these metal objects several Late Saxon Thetford Ware pottery sherds (NHER 22451 and 21788) were recovered. The fact that a few of these items seem to cluster around the parish church may suggest this was an area where some sort of Saxon activity took place. The medieval period is the first period to have a monument or building that survives into modernity, namely All Saints’ Church (NHER 11603). This church is situated on a windy upland with fields all around. The church itself dates to the 13th century but the south porch dates to the 14th century and many of the nave windows are 15th century replacements. Inside the 19th century kingpost roof is visible, but older arched braces survive above the site of the rood screen. This was one of the first Norfolk churches to replace its box pews for benches and these survive along with an elaborate font and cover dating to 1846. A scatter of medieval objects at a site across the road from the church has been interpreted as evidence for the existence of a dwelling (NHER 21788). However, a good number of the medieval objects recovered from the parish are spread across the landscape. Only a selection of the finds can be mentioned here as there are so many. A number of artefacts of a religious nature have been found and these include a lead ampulla (NHER 21708) and several Papal bullae with examples relating to Pope John XXII and Pope Gregory XI (NHER 22873). A number of seal matrices and cloth seals (NHER 25681) have been found, and thus provide evidence for medieval trading in Skeyton. One of the seal matrices had a squirrel motif (NHER 22609), while the other had a bird (NHER 23284). Other finds may show the presence of wealthy individuals, with a sword pommel (NHER 38090), finger ring and falcon bell (worn by the bird during falconry) (NHER 25682). In addition to these objects, several more common items relating to everyday medieval life have been found in Skeyton. These comprise items like buckles (NHER 22226), spurs (NHER 22450), metal vessels (NHER 22769), bells (NHER 23837) and pottery sherds (e.g. NHER 21785). The nature of the parish in the post medieval period is not immediately clear from the archaeological records. Documentary evidence shows that there was a brickworks that specialised in the production of chimney pots (NHER 19344). There were also two inns in the village by the 17th century: The Black Horse (NHER 29024) and The Goat Inn (NHER 47796). The thatched Goat Inn still operates in its original capacity but the Black Horse is now a residential property known as the ‘Old Black Horse’. A couple of other properties have been listed as of architectural interest including Gable End (NHER 14005), a thatched 17th century cottage, and The Lodge (NHER 47466) which dates to the 18th century and has a fine central porch with cement-rendered Doric columns with pilaster responds and a plain frieze. It seems likely that the parish was still reliant on traditional agriculture and farming during this period, as the archaeological records do not demonstrate a great deal of manufacturing. A couple of significant post medieval finds in Skeyton merit a mention at this point. A possible hoard of post medieval coins consisting of three groats and two half groats of Elizabeth I, with two other contemporary coins has been found (NHER 21786). An early post medieval dagger (NHER 38090) and lead 4oz weight stamped with four circular indentations and a crowned IR (for James I or II) with the arms of Norwich have also been retrieved by metal detecting. Lastly, a small lead soldier that would have been a child’s toy has been recorded (NHER 25681). Nothing relating to the First World War, Second World War or modern period has been recorded in Skeyton. As such, this brings an end to the overview of the archaeology found in the parish. Interested readers should access the individual records to learn more.